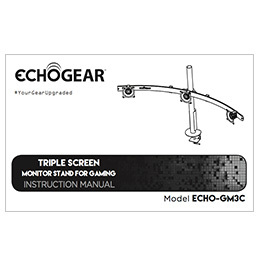 ECHOGEAR Triple Monitor Desk Mount For Screens Up To 27"
10" - 27" 3 0.5"-3.25" 28"
Welcome to the big leagues: This Triple Monitor Height-Adjust Mount is a multi-monitor solution designed to take your gaming setup to the next level. Ideal for array-style, immersive gameplay, its durable, aircraft grade aluminum design holds all of your 10" - 27" screens steady and perfectly aligned. 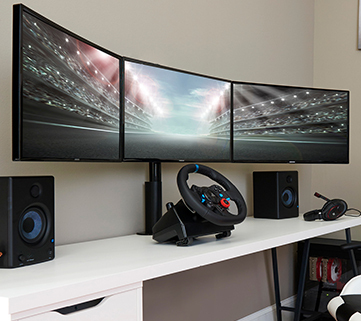 Enhance your setup & save desk space by desk mounting your 3 monitors. 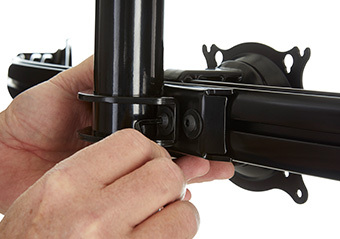 Top notch build quality & clamp design for a pro look. Built-in cord-wrangling channels and nearly-hidden hardware means a sweet looking desk. 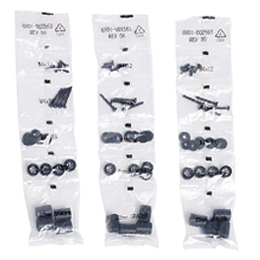 Install is a breeze with our world-class instructions & included hardware. Our ECHOGEAR Pros are here to help 7 days a week. 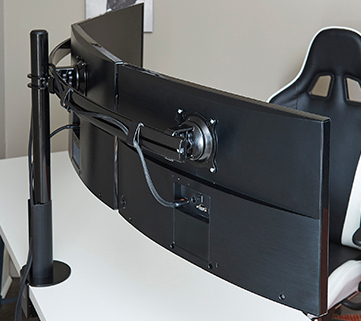 According to doctors and people smarter than me everywhere, a correctly positioned monitor helps keep your neck, back, and eyes more comfortable while gaming, especially during those extended weekend gaming binges. Chances are your stock monitor stand isn't giving your neck the love it deserves. Mounting your monitors to the desk solves that by letting you adjust the height, tilt, and alignment of your setup. Easily adjust tilt with just your hands either up or down 15º. No more annoying glare plus reduced stress if your current monitor stand causes you to look down or up at the screen. Pair the tilt with up to 25" of height adjustment and boom, you've got the perfect monitor setup to keep your body feeling good and your game strong match after match. 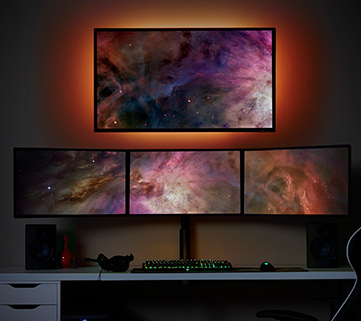 You haven't optimized your beautiful triple monitor setup unless you're using a mount. Perfectly align your screens and lock them in at the perfect angle. 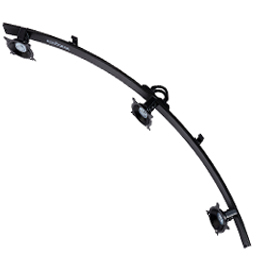 This triple monitor mount can hold screens up to 27" each for up to 72" of seamlessly aligned monitors. Not only do you get the benefits of correctly positioned screens, but you'll free up extra desk space for all your accessories or empty Red Bull cans. No judgment, those raids aren't going to complete themselves. If your 3 monitors are all on their own stand, you’re wasting space. By desk mounting, there is one mounting point to rule them all, and that means extra space around & even under your screens. Break out the duster, you've never been able to use your desk like this before. Now there's a place for all your gaming accessories like your Yeti mic, headphones, and those desk speakers you never had space for. Oh, and we almost forgot to mention, built-in cable management will give you the sharp finished look your battlestation has always needed. Route cables behind the monitor and down the mounting pole for a nearly cable-less setup. With more screen and less cable, you'll be seeing your game the way it was meant to be seen, distraction-free. Half the fun of building a gaming setup is making it your own, but let's face it, we all don't have an unlimited budget or savvy design skills. 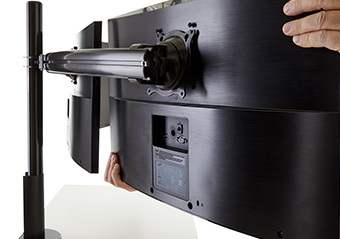 Using a monitor mount will let you create a custom screen array with a professional finish. Position your monitors in either horizontal or vertical position, so you make the most out of every pixel. Change the orientation whenever you want to fit what you are playing or working on. Nothing is more distracting in the middle of a mission than screen wobble. Our wobble-free clamp design will stabilize your monitors amidst your button mashing frenzies and keep you immersed in the game. No more adjusting each individual screen every time your desk gets bumped. 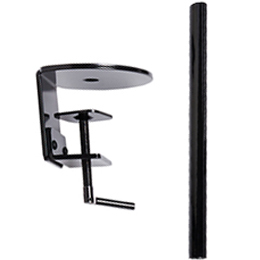 Mounting is the best way to keep screens in the perfect position. Chances are you'll be upgrading monitors at some point (hello 4k). 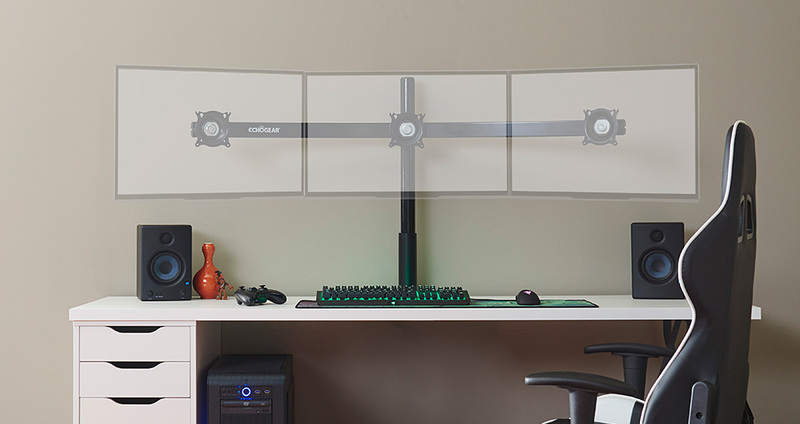 Luckily this will be the last triple screen mount you'll need. Quickly switch out screens without re-installing the mount. Oh, and installation is super easy. In 3 steps you'll be ready to jump back online. Note: if your monitor doesn't natively have a VESA pattern, it may not work even if you have an adapter. Contact us to ensure compatibility. "It took me a little bit to get the monitors in the right position but once I did they look great. Would highly recommend." -Samantha. Get back to your game. With our easy 3-step install and expert customer support, your battlestation will be upgraded in no time. 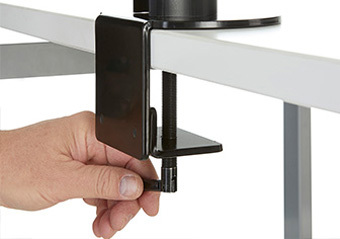 Click the button below to add the Adjustable Triple Monitor Desk Mount to your wish list.